Our Patagonia adventure begins on arrival in El Calafate, where we meet our Expedition Leader and fellow travelers at a welcome dinner this evening. This morning, enjoy birdwatching on Patagonia’s largest freshwater lake, fed by the glacial meltwater of several rivers. More than 40 migratory bird species frequent Lago Argentino, including black-necked swans, flamingos and silvery grebes. Later, we cross the broad expanse of Patagonian steppe that sprawls beyond El Calafate. Along our drive, admire magnificent views of glittering Lago Argentino, cross several river valleys, and drink in panoramas of the Southern Andes and Mount Fitz Roy. Continuing to El Chalten, we make our base in the small alpine-style town that is the hub of Patagonia adventure travel. North of El Chalten, we take a scenic hike through the Magellanic subpolar forest—the southernmost forest ecosystem on Earth—to reach magnificent vistas of the surrounding mountains. A gentle, rolling trail through the beech woodlands rewards our efforts with arresting views of glaciers and the Fitz Roy massif’s evocative spires. Walking above the Rio Blanco, we hike to the Piedras Blancas lookout, with a panorama over the glacier that lies in the heart of Los Glaciares National Park a UNESCO World Heritage Site. Standing in silence, listen for sound of the ice cracking and groaning as it grinds its way down the bedrock at the base of this hanging valley. After one last vantage point from on high, we retrace our steps down the trail, with more exhilarating vistas along the way. Dinner this evening is at one of the hospitable restaurants that abound in the charming alpine town of El Chalten. Today we hike from town to one of the most iconic views in Patagonia: the granite towers of Cerro Torre. A rolling trail through the valley rewards us with stunning views of the massif, easily identifiable by its gray spiked peaks. The highest point in the range is more than 10,000 feet, and the distinctive spires are a popular challenge for advanced rock and ice climbers. Cerro Torre itself was not successfully climbed until 1974. The surrounding views of glaciers, snowfields and pine-studded valleys are equally grand. We'll picnic with a box lunch along the way, then hike back this afternoon to the town of El Chalten, keeping an eye out for Andean condors gliding overhead. Continue on to El Calafate where we have dinner and spend the night. The day's adventures in Los Glaciares National Park begin with a private boat cruise on the Brazo Rico, the southern arm of Lago Argentino. We disembark for a short hike along a secluded shoreline and through the forest to arrive at a vantage point on the southern face of Perito Moreno Glacier. One of the most famous of the 48 outlet glaciers spilling from the nearly 6,500-square-mile mass of ice that comprises the Southern Patagonian Ice Field, Perito Moreno is also one of the few advancing glaciers on the planet. Nearly 200 feet high, it winds down from the perpetual snowfields of the Andes to its terminus in the vast lake, calving floating rafts of ice into the turquoise water. Reboarding our small vessel, we get a closer view on the jagged blue ice walls of the glacier's face, which spans more than 3 miles across. Back on shore, it's just a short distance to the official entrance for sightseeing at Perito Moreno, where boardwalks in the area offer varied viewpoints on the glacier and drifting icebergs. Driving across pampas and steppe, we enter Chile and Torres del Paine National Park, where we'll spend the next three days exploring. A UNESCO Biosphere Reserve, the park is home to a host of wildlife including puma, guanaco, fox, huemule (South Andean deer) and armadillo. 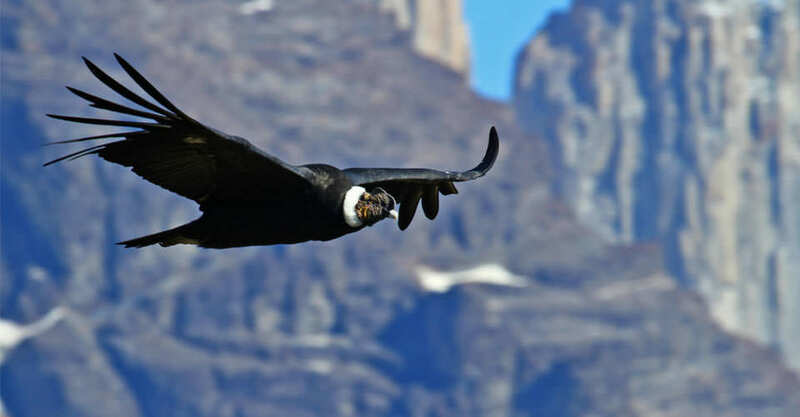 We find an impressive array of birdlife here, too: look for eagles, hawks, rheas, buzzards and South American condors back from the brink of extinction. Dominating the horizon are the famous Torres del Paine—the "horns and towers of Paine"—igneous rock spires millions of years old. A stay at renowned EcoCamp Patagonia offers low-impact luxury accommodations in the wilderness. Domed suites are modeled on traditional Kawesqa native huts, blending artfully with the wild landscape. Warm and wind-resistant, these nomad-style dwellings offer outstanding views and a complete immersion in nature. There are plenty of hours ahead to absorb the beauty of this stunning landscape. At the height of the southern summer, the sun doesn't set till around 11 pm, offering magical evening light by which to watch fuzzy guanacos grazing on the steppe, backdropped by the mythical-looking peaks. As the sun finally dips below the horizon, the spires are bathed in rosy alpenglow—a fitting finale to a fabulous day. Our day begins early with a drive to the southern part of Torres del Paine National Park, watching overhead for Andean condors and eagles hunting hares and small rodents. As we traverse the park, we stop at an array of famous viewpoints. Survey the snow-clad massif of Paine Grande, highest in the range, and Los Cuernos, famed for its dark granite horn-like spires. On a calm day, brilliant blue Lake Pehoe reflects the serrated peaks like a mirror. We follow its shoreline to Salto Grande Falls, a thunderous cataract that pours into the lake from Lake Nordenskjold above. After a day of extraordinary scenic grandeur, a hearty dinner awaits back at EcoCamp. Travel to the eastern side of the park this morning to follow the sendero de la fauna—the animals' trail—so dubbed for the many guanacos frequently seen along the route. It winds through a favorite puma hunting area where we may see the remains of camelids that the big, tawny cats have preyed upon. "Puma" is the name the Incas gave to this feline predator also known as a cougar or mountain lion. High rock formations flank the path, serving as dwellings and lookout points for the pumas. While these stealthy cats are notoriously elusive, we have been seeing more of them in the past few seasons. We'll hope to further that luck on a nature walk through territory they are known to frequent regularly, as our Expedition Leader helps us scout for signs of their presence. Then, if time permits, we’ll visit a nearby cave with ancient paintings decorating the walls, mostly representing guanacos. Our day continues with a drive to Laguna Azul in the northern part of the park, where on a clear day we get a view of the famous Towers of Paine from a completely different angle. We also stop at Cascada del Rio Paine to view of this series of beautiful terraced waterfalls. On the drive across Torres del Paine National Park this morning, admire views of the Paine mountain range from varying angles, observing herds of guanacos, Andean condors and interesting flora along the way. Once we reach our destination, we cross a hanging bridge into a tract of Magellanic subarctic forest that provides fascinating insight into the diversity of endemic austral trees. All the classic species are on display here—lenga, ñire and coihue, a tall evergreen that can grow to 140 feet. If we’re lucky, we may spy the Magellanic woodpecker and a rare Chilean deer called the huemel, a national symbol found on the coat of arms on Chile's flag. Our forest trail emerges onto the windy beach at Lake Grey, where icebergs rest on the shore. In the distance, view the Grey Glacier, a tongue of the Southern Patagonian Ice Field that feeds the lake. After a day of magnificent vistas on the western side of the park, return by road to Ecocamp Patagonia to spend a final night. Our grand Patagonia adventure concludes as we depart the park today and head to one of the world's southernmost cities, Punta Arenas on the Strait of Magellan. Along our leisurely drive, we'll stop for lunch and exploring in Puerto Natales, an attractive town on Ultima Esperanza Sound that serves as a gateway for trips into Chilean Patagonia. The town is backdropped by the Riesco Mountains, the Paine Massif and glaciers of the Southern Ice Field, while in the foreground, black-necked swans and gulls bob on the misty waters of the sound. In Punta Arenas, we gather for a farewell dinner to celebrate our Patagonia adventures. A transfer to the airport is provided for flights home.